In my last post I described how a Bluetooth connection between Arduino and a Windows 8.1 device can be established. The next step for me was to connect the Arduino to my electronic drum kit which has both, a MIDI-IN and a MIDI-OUT jack, but any other electronical instrument will do as well. 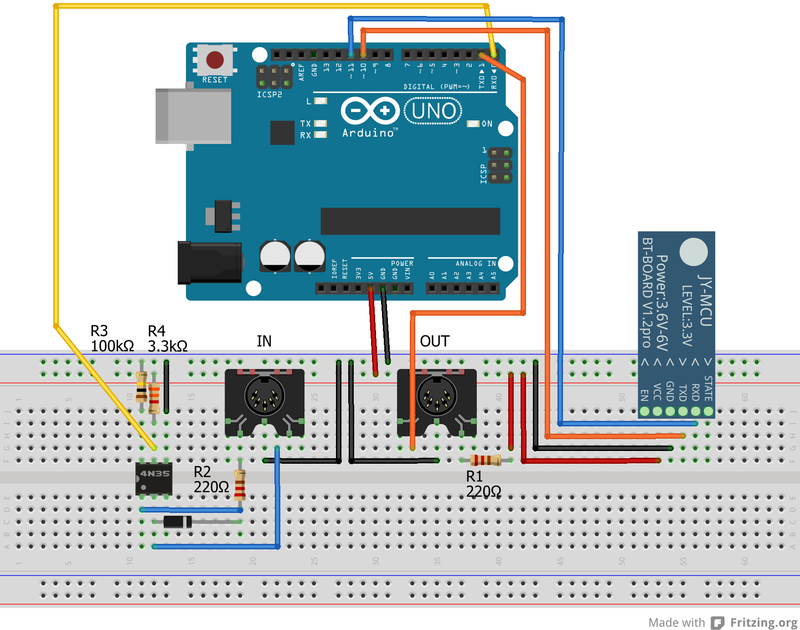 The wiring diagram for an Arduino Uno R3 with MIDI-IN/OUT and the JY-MCU Bluetooth module is shown in Fig.1. NOTE: Occasionally there are MIDI shields available for Arduino, so you might not have to build it on your own. The Arduino code to relay MIDI>Bluetooth and Bluetooth>MIDI is actually quite simple. Can I run this sample code on Win7 laptop? No, this particular code won’t run on Windows 7, however you should be able to find examples how to use Bluetooth from a WPF application. You can then adapt the communication principle to work with your WPF app, probably even without altering the Arduino code. how to direct the midi message to Bluetooth interface on WIN8 tablet?